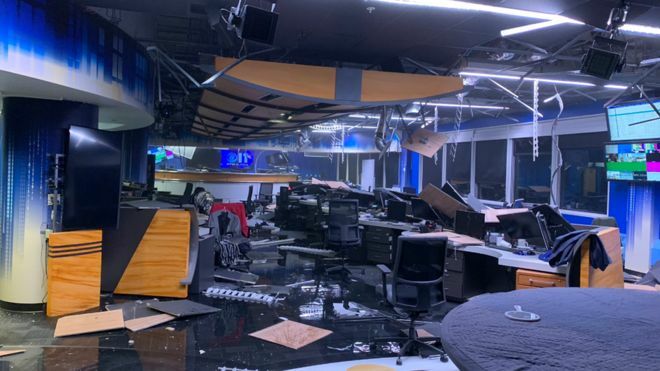 A powerful 7.0 magnitude earthquake has struck Alaska, causing people to run from buildings and prompting a tsunami alert for coastal areas of the state. The quake was centred about 7 miles (11km) north of Anchorage, the largest city in the state, according to the US Geological Survey (USGS). The tsunami warning issued for the Cook Inlet and southern Kenai Peninsula regions has now been cancelled. White House Press Secretary Sarah Sanders tweeted that President Donald Trump has been briefed on the quake and is “monitoring damage reports”. Air and rail travel has been disrupted by the quake as well. One of the state’s largest internal airline services has suspended operations until midday. “The aftershocks of the one today have been worse than any earthquake I’ve ever been in before,” he said.